How much did Back to the Future get correct about life in 2015? That’s what NBC Nightly News explored on Tuesday, with Reston Town Center and a time machine DeLorean as the backdrop. 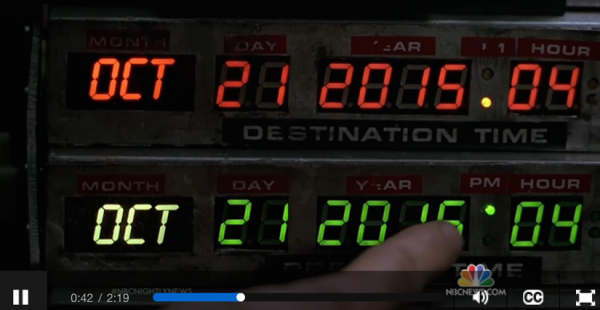 Oct. 21, 2015 was the exact date Marty McFly and Doc Brown found themselves in in the second Back to the Future movie. It was a world with drones, hoverboard skateboards, flying cars, video phone calls and the Cubs winning the World Series. Well, we’re constantly on the video calls and the Cubs, despite being down 3-0 in the National League Championship Series, still have a (slim) shot. The tricked-out DeLorean — owned by Back to the Future enthusiast Ken Smith — has been at Reston Town Center all week as the Washington West Film Festival prepares to open tonight. A showing of the entire Back to the Future trilogy begins at Bow Tie Cinemas Reston at 7 p.m.
Reston received a proclamation from the Fairfax County Board of Supervisors over the summer ceremoniously changing its name from Reston to Hill Valley, where Back to the Future took place, for the duration of the festival. Sunday will feature a red carpet screening of the first movie, and a Q-and-A featuring star Christopher Lloyd. That event is sold out. Check out the NBC News report.